HomeCan You Make a Roux? Can You Make a Roux? One of the many jobs in my illustrious history was that of executive director of a child care center in New Hampshire. It was a job I enjoyed and as usual learned I something in the eighteen months I spent there. The center was not big, about 60 kids between the ages of 3 and 10. The staff was great and committed to all the kids and their families. One of the staff, Mrs. Soucy, had been with the Center since day one, twenty-five years. She did administrative tasks, filled in as teacher when someone was out, drove the van to drop off and pick up kids at school, and the best part–she was the cook. 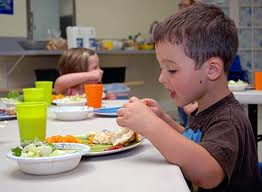 No institutional meals for these kids, everything from scratch! When Mrs. Soucy was out, as you can imagine if I was the director, I filled in for her. Now this was back when my cooking skills were not as refined as they are now and there was no Food Network to support my success. In fact, the first time I made turkey gravy I thickened it so much with cornstarch, that a spoon literally stood straight up in the pot. Since I was about to be cooking for 40 toddlers and preschoolers, well, let’s just say, there was some training needed. The first time I had to fill in for Mrs. Soucy I had advanced notice. She would be out on vacation for one week, which meant for the week prior I would be the cook-in-training with her looking over my shoulder. (Anyone who knows me might be laughing right now; having anyone looking over my shoulder for anything is not enjoyable, for anyone.) On the menu for Friday’s lunch was baked macaroni and cheese–as in homemade; the melt-the-cheese-in-a-pot-with-milk-and-toasted-breadcrumbs-on-top kind! The kids loved her mac ‘n cheese and hardly complained when it wasn’t the kind they’d get at home from the blue box. To start, we’d put all the ingredients out on the counter, and since Mrs. Soucy had done this a thousand times before, she didn’t have a written recipe anywhere–it was all in her head. She started by directing me to make a “roux”…”a what, now?” I asked. I had no idea what she was talking about. After a quick explanation of the butter and flour mixture I was on my way! Of course the next week, while Mrs. Soucy was on vacation in sunny Florida, the kids knew everything just didn’t taste quite the same as when Mrs. Soucy made it. 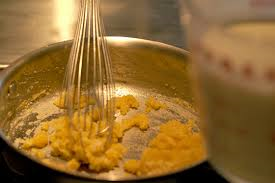 For some it may not sound like such a big deal, learning how to make a roux; but it really, really was for me. For just about the last twenty years my gravies, chili, mac ‘n cheese, anything that needs thickening, have all started with a roux. I never use cornstarch anymore–all thanks to Mrs. Soucy! !